I’m taking some liberties in our visit to the Museum. I’m skipping a couple of drinks (Between the sheets – a great cocktail, and one we’ll revisit someday; The Berlin Station Chief – sounds weird and I just can’t bring myself to make it yet; The Bellini – I’m waiting until peaches are in season) and moving onto the Bijou. 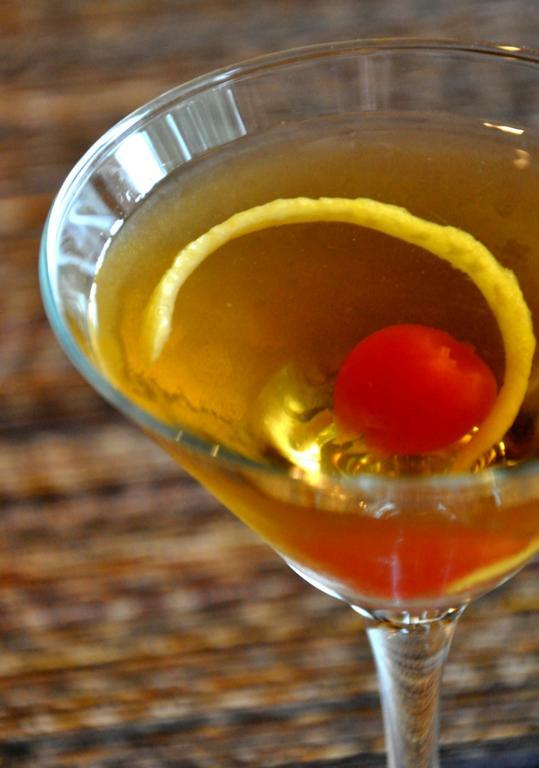 The Bijou Cocktail was created by Mr. Harry Johnson and the consensus is that the recipe first appeared in his book The New and Improved Bartenders Manual. This is a spirit-forward herbal cocktail, containing equal parts gin, vermouth, Green Chartreuse and bitters. Let’s take a look at one of the ingredients of this cocktail, and special favorite of mine. 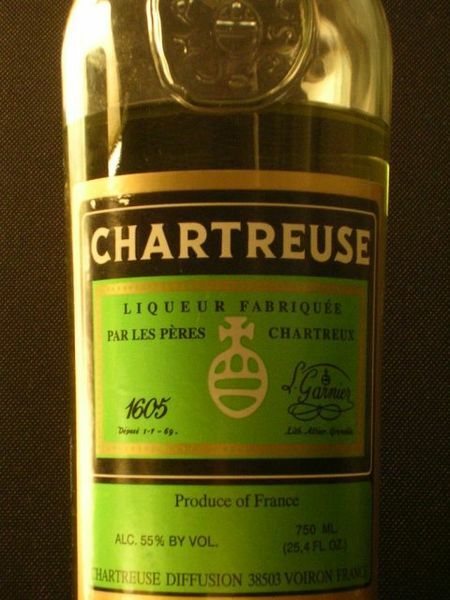 Green Chartreuse (it also comes in Yellow) is an herbal liqueur made by Carthusian monks, and it really is green. The recipe is thought to have originated in 1605 as an “elixir of long life.” The recipe is a carefully guarded secret, and to this day, supposedly only two monks at any one time know the recipe for the herbal mixture that is used to make Green Chartreuse. The ‘Green’ in Green Chartreuse is Chlorophyll B which is produced by the 132 botanical ingredients used to make the liqueur. (Interestingly, chlorophyll also contributes to the color of absinthe). Chlorophyll donates an electron in this reaction. Chlorophyll is involved in a cascade of sophisticated reactions known as Photosynthesis (simplified above). This is how plants get energy and produce oxygen, and is in fact the source for the majority of all oxygen in our atmosphere. So it is with no great surprise that Green Chartreuse was known as an elixir of long life, for the same ingredients that make this liqueur, also contribute to the air we breath. Stir, strain in to a chilled cocktail glass, garnish with cherry and lemon twist. Cheers! 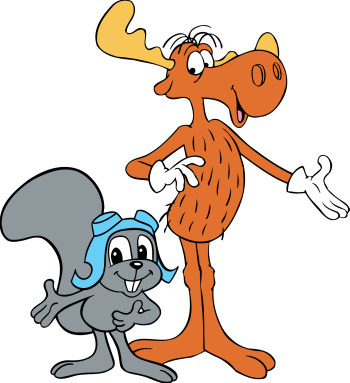 There have been many famous duos and partnerships throughout history….Laverne and Shirley, Rocky and Bullwinkle, Bonnie and Clyde, Captain and Tennille, Tarzan and Jane, Thelma and Louise, and the list goes on. Today, a new partnership and dynamic duo joins this illustrious list of famous twosomes. I am pleased to announce that Sugar Sand Photography is teaming with the Libation Laboratory to bring you not only tasty cocktail recipes, history, science and narrative, but also sparkly, shiny, mouth-watering pictures to photo document the adventure. The Laboratory is lucky to have the expertise of Sugar Sand Photography; this is some serious professional photography, folks. It’s safe to say, the Libation Laboratory has just kicked it up a notch. Stay tuned, keep your hands in the car, and hang on; this is going to be fun.